HOUSTON – The astronauts aboard the space shuttle Discovery are nearing the end of the shuttle's final mission, and the sentiments among the six crewmembers are a mixture of sadness and pride. 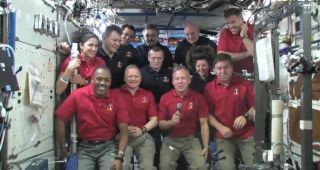 Discovery's astronaut crew was joined by the six Expedition 26 space station residents for a live media interview today (March 4). Following this mission, Discovery will be retired from service after 39 trips into space, including 13 visits to the International Space Station. "Right now, we're docked with more than a million pounds," shuttle pilot Eric Boe said. "Majority of the U.S. segment was brought up piece by piece by the space shuttle." On its last 13-day mission, Discovery delivered spare parts, an outdoor storage pallet, and a new and much-needed storage module to the station. This storage module, which will function like a big space closet, is the final NASA addition to the fully constructed station. "This space station here now is the largest pressurized volume in space in history," said mission specialist Nicole Stott. "Volume wise, it's equivalent to the interior of a [Boeing] 747 or a little bigger. It makes for a really wonderful resource for science and living, and just being up here floating around is great." Discovery also ferried a new permanent resident to the space station – a dexterous humanoid robot named Robonaut 2. This robot is part of a technology experiment between NASA and General Motors to see how robots can help lighten the workload of astronauts on the station. "We want to learn those lessons here on the inside before we send them to the outside of the space station or other planet," station astronaut and Expedition 26 crewmember Cady Coleman said. "I am looking forward to working with him." Yesterday, flight controllers here at NASA's Johnson Space Center decided to extend Discovery's STS-133 mission, giving the orbiter a total of 13 days on orbit for its final flight before retirement. With this extension, Discovery is now scheduled to undock from the space station on Monday (March 7), and land on Wednesday (March 9) at the Kennedy Space Center in Florida. And the moment when Discovery's wheels roll to a stop for the final time will likely be tinged with sadness. "It's going to be a sad day," Stott said. "We all appreciate the legacy and history and the really fine work that the space shuttle has done, and it's going to be hard to walk away from Discovery on the runway that day. Everybody is proud to be a part of this program. Everyone will be sad to see it ending. In the end, we'll be able to take time to celebrate the wonderful program and all the experience we've gotten out of it."